East Midlands Parkway Station, which opened at the beginning of last year, has beaten its target for passengers. 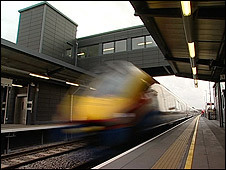 The £25m train station, near Junction 24 of the M1, was used by more than 250,000 people in the first 12 months. A decade in the making, the station is intended to take traffic off the motorway and serve the nearby airport. East Midlands Trains said it was pleased with the results and it was aiming to double passenger numbers within five years. East Midlands Trains' Commercial Director David Horne said the facility had overcome doubts about its location. "It is not near any large areas of housing but it is right next to the M1, the A453 and East Midlands Airport so we are in a great place to get people out of their cars. "We have been working with the Highways Agency to improve signage but even with that we are very happy with the numbers of people who have chosen to use it." More than 100 services stop each day, with trains to and from London every 15 to 20 minutes at peak times. The station has four platforms, step-free access and 850 parking spaces. It also uses a ground-heat system as well as locally sourced and recycled materials.